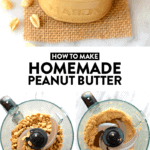 Have you ever wondered how easy it is to make your own homemade peanut butter? 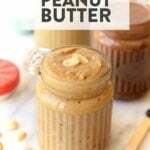 This healthy peanut butter recipe is quick, simple and skips all those fillers found in many store-bought peanut butters. Have you ever made your own homemade peanut butter? You totally should because it’s so easy. All you need is 1 ingredient (peanuts) and then any of your favorite flavor add-ins for extra flavor and texture. 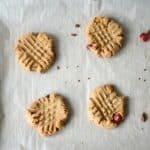 Today we’re going to teach you how to make peanut butter in your own home that doesn’t have any added fillers or sugar. So? Get your food processor out and let’s get peanut butterin’. 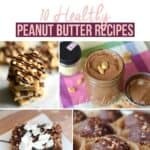 Below you’ll find a list of peanut butter nutrition facts and other fun things about peanut butter. Please do note that we are referring to all-natural peanut butter AKA peanut butter made with nothing other than…peanuts! Now that you know all of the amazing health benefits of homemade peanut butter, it’s time to make your own at home. In addition to your dry roasted peanuts, you’ll need a high-speed food processor or Vitamix. I say high-speed and I mean high-speed. 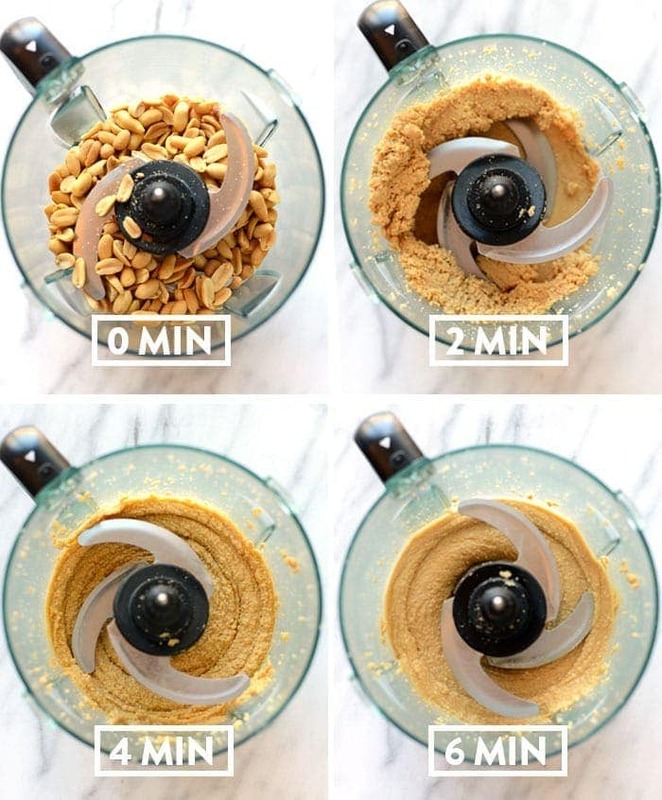 The better quality food processor you have, the easier it will be to make peanut butter. Step 1: Place peanuts in a high-speed food processor. Step 2: Cover and turn food processor to high and let process for 5-7 minutes Scrape the sides every so often to make sure all peanuts are getting pulverized. The peanuts: we’ve found that roasted peanuts are the best for peanut butter. However, you can totally use raw peanuts. I did want to make a note that all peanuts are different. For example, if you use peanuts that aren’t as fresh, it’s likely that their oil content is much lower and you may need to add a little coconut oil in order to smooth things out. So? If it’s been 7 minutes and your peanuts still haven’t turned into butter, just add a little coconut oil! 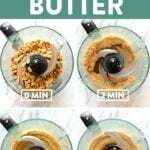 The food processor: the food processor is a big deal when it comes to homemade peanut butter. You’ll want to make sure you’re using something powerful enough to turn peanuts into peanut butter. We highly recommend a Vitamix. HERE’s the one we have (totally worth the investment). 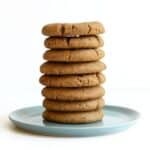 While a simple homemade peanut butter recipe made with just peanuts tastes incredible on its own, we suggest having fun with it and flavoring it with some add-ins. Check in some flavor inspiration below! 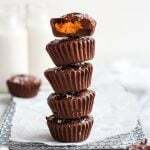 This chocolate sea salt homemade peanut butter is sweet and salty at the same time made with dark chocolate chips and sea salt! This honey vanilla homemade peanut butter is naturally sweetened with honey and enhanced with a splash of vanilla! 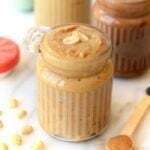 This crunchy maple cinnamon peanut butter is sweetened with 100% pure maple syrup, spiced with a touch of cinnamon, and texturized with whole peanuts! Place 3 cups of peanuts in a high-speed food processor. Process peanuts on high for 5-8 minutes, stopping every minute or so to scrape the sides if needed. You know your peanut butter is ready when it’s drippy (it took us about 6 minutes!). Place 3 cups of peanuts in a high-speed food processor. Process peanuts on high for 5-8 minutes, stopping every minute or so to scrape the sides if needed. You know your peanut butter is ready when it’s drippy. Add in honey, vanilla extract, and coconut oil and blend. At this point your peanut butter might seize and get uncreamy. This is normal and what the coconut oil is for! Blend for 2-3 more minutes or until things smooth out again. Add in dark chocolate chips and sea salt and blend for about 1 more minute or until everything is mixed. NOTE: use room temperature chocolate chips. Frozen/cold chocolate chips might seize your peanut butter! Add in maple syrup, ground cinnamon, and coconut oil and blend. At this point your peanut butter might seize and get uncreamy. This is normal and what the coconut oil is for! Blend for 2-3 more minutes or until things smooth out again. Finally, add in whole peanuts and pulse a few times until they get chopped and mixed in! Storage: store peanut butter in an air-tight container for up to 3 months. Best if kept in the refrigerator. 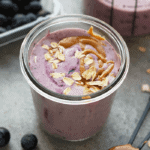 Nutrition information is based on classic homemade peanut butter recipe.